Arthritis is a disease that can affect all the joints in the human body. People with arthritis generally have stiff and painful joints, and may also have swelling and tenderness of the joints. Arthritis is generally a long-term or chronic condition in which the disease slowly gets worse over time, leading to more pain and gradual loss of the ability to move the joint or joints affected. Based on statistics from the Centers for Disease Control (CDC), arthritis is the leading cause of disability in the United States. Approximately 80% of arthritis is thought to be caused by damage to the joints that builds up as people age. This is called osteoarthritis (OA). According to the National Institute for Arthritis, Musculoskeletal and Skin Diseases, more than half of the population of the United States aged 65 and older would show evidence of osteoarthritis in at least one joint if X-rayed. Treatment for OA generally involves a combination of analgesics, exercise and lifestyle modification. Joint replacement surgery may be used to improve the quality of life if pain becomes debilitating. Rheumatoid arthritis (RA) is a chronic, systemic autoimmune disease that causes pain, swelling, stiffness and loss of function in joints. It can also affect parts of the body other than joints, such as the eyes, mouth and lungs. 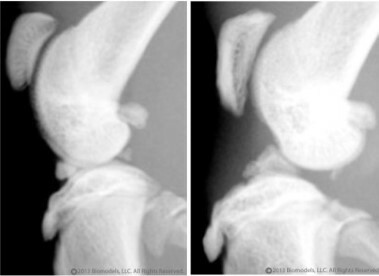 The pathology of RA often leads to the destruction of cartilage and the fusion of joints. RA has a prevalence of 1% worldwide and occurs in women about 3 times more frequently than in men. Non-drug treatments for RA include physical therapy, occupational therapy, and nutritional therapy, but they do not prevent joint destruction. Anti-inflammatory drugs and analgesia are used to combat the symptoms of RA, while disease-modifying antirheumatic drugs (DMARDs) inhibit the immune processes that underlie the disease. Biologics that target immune factors associated with the disease (such as TNFα and IL-1) are a recent addition to arsenal of treatments for RA. Biomodels offers a model of surgically-induced osteoarthritis (OA). This paradigm involves surgically transecting the anterior cruciate ligament (ACL) without damaging the meniscus. The wound is closed and the animal is allowed to move freely. OA develops over a period of 4-5 weeks and can be successfully treated with intra-articular injections of anti-inflammatories. End points in this model include scores based on the Osteoarthritis Research Society International (OARSI) modified Mankin Scale and X-rays. The results of OA experiments using this model are directly translatable into human use. The disease we are creating in rats most directly resembles the damage that can occur in sports injuries where the anterior cruciate ligament (ACL) of the knee is damaged or severed, but the disease process of osteoarthritis is thought to be common to all joints that are affected. 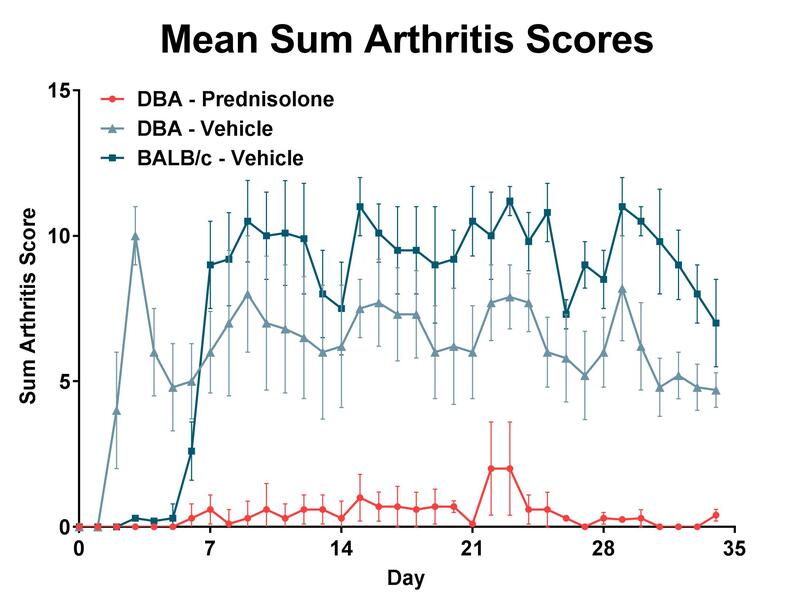 Arthritis in induced via the combination of collagen antibody and Lipopolysaccharide (LPS), with LPS given several days after the collagen antibody. In this model, arthritis should become apparent shortly after LPS is administered and peak a few days after that. Arthritis evaluation of each paw involves a 5 point scale (0 – 4) and the use of calipers to measure paw thickness as an indication of swelling. In this model, arthritis is induced via the combination of chicken type II collagen and Lipopolysaccharide (LPS), with LPS given several days after the second collagen injection to help synchronize the onset of arthritis. This paradigm results in inflammation of the joints beginning around day 20-30, reaching near peak levels by day 45, and continuing until the end of the study on day 60. 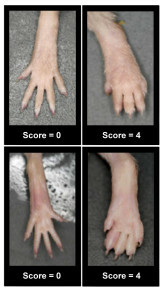 Arthritis evaluation of each paw involves a 5 point scale (0 – 4) and the use of calipers to measure paw thickness as an indication of swelling.